In the aftermath of the US financial crisis of 2007-2009 an “estimated $8 trillion of wealth in the US stock market was lost on top of the $6 trillion loss in the market value of homes. The total wealth loss of $14 trillion by US households in 2009 was equal to the entire 2008 US GDP” (Liu, 2013, para. 1). When the banks first revealed that they had taken on at least $2 trillion of toxic assets that were beyond their capacity to withstand financially, the government stepped in. Citing “too big to fail” (TBTF) as the basis for emergency government action, both President Bush and President Obama implemented unprecedented levels of financial bailouts for the banking industry. “[T]he special counsel for TARP reported that the government committed an astounding $23.9 trillion to support the banks” (Quirk, 2012, p. 40). Despite the unprecedented efforts to save the banking industry, hundreds of banks failed, and many were consolidated into a perilous centralization of wealth among even fewer mega-banks. One such outcome is that, “Our four biggest banks now hold more than $7 trillion of assets, up 50 percent since the crisis” (Quirk, 2012, p. 40). “Neu Barofsky, the former special inspector general in charge of oversight of TARP, writes that a major cost of the bailout is the perpetuation of the existing financial system: Paulson and his successor, Timothy Geithner, ‘hadn’t just saved the banks, they’d also preserved a status quo that was dangerously broken, and in so doing they might have actually increased the danger lurking in our financial architecture’” (Quirk, 2012, p. 32). Richard Fisher the President of the Dallas Fed, said in a post-crisis analysis that a “dozen behemoths account for roughly 0.2 percent of all banks, but they hold 69 percent of industry assets” (Fisher 2013). 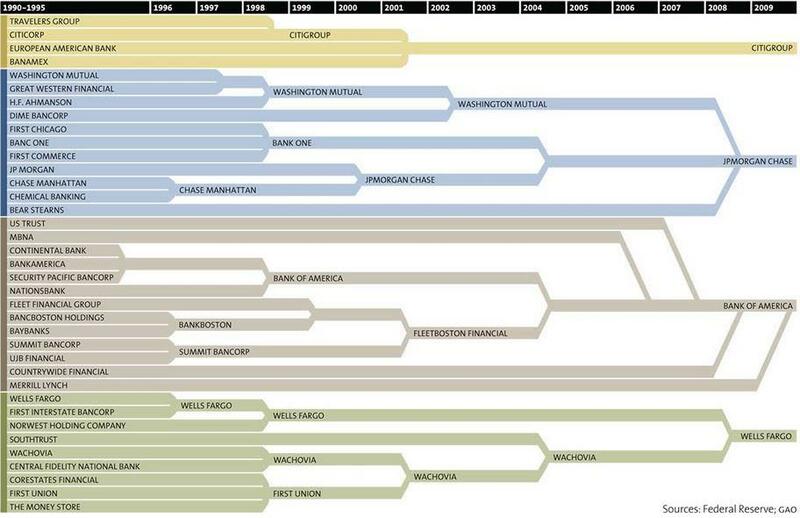 Now with fewer banks controlling even more US banking assets in a complex industry that remains largely unreformed from the mistakes of the past, we may be doomed to repeat them. Banks clearly know the extent to which TBTF protects risky behavior, and those risks and complexities of the mega-banks have only grown bigger than before. Too Late. Remarks before the Committee for the Republic. Washington, D.C. Advantages of ROI and ROE Decomposition A Forensic Review of Enron’s Financial Statement… Interpreting Financial Statement “Forces” Impact of Financial Leverage What is Financial Fraud?